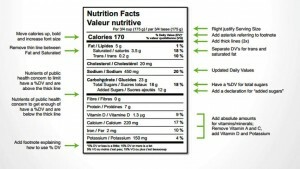 Do you know how to properly, and thoroughly read a nutrition label? I bet a lot of people cannot seeing the results that many are getting from the foods that they eat. Many think that because its low calories that it is healthy for you. But what about all the other facts on the label? It’s the things like sugar, carbohydrates, and cholesterol that people should be reading on the label. Did you know that diet soda is actually worse for you than regular soda? Probably not because you were only focusing on certain parts of the label. Another mistake that many make is the serving sizes. A label can have a serving size that you may think is the right one, but it is actually how many servings are in that type of packaging. Along with how to read the label and the importance of each one, you should also read the ingredients on the label. I always went by this, if you can’t pronounce the ingredient then you shouldn’t be eating it. Most of those words that you can’t read are ingredients that are horrible for your body and do nothing for you. So from now on when you go to the store, read your label slowly and carefully because you will be able to know which food is best for you overall and you won’t get fooled by the label’s loop holes! « Never Run on Empty; Hydrate!! !